Sawyer is home! It was an incredible feeling leaving the hospital ,especially considering just 24 hours before Sawyer was in the intensive care unit. We are still on a big high celebrating God's mercy on Sawyer. As we got closer to home, our excitement grew. It felt like the drive home after he was born. On arrival, Sawyer was greeted by all of his neighborhood friends and his CPC family brought by a yard full of balloons. He was wiped out, but you could tell he was glad to be home. We sobered from the homecoming as the reality check of our "new normal" quickly came upon us. You know your in trouble when the pharmacist is taken aback by your prescriptions. We did Sawyer's dialysis like pros in the hospital, but we looked more like amateurs during our first run at home. Humbling, but there were a few complications that we never experienced before. As of this moment Sawyer is resting well while watching a movie with his brothers and sister. His dialysis is now on track. This first treatment will last 14 hours, which means he cannot get more than 3 or 4 feet away from his bed until sometime after 11AM tomorrow. We had to get a port-a-potty because of his short PD leash. He has the one with the CARS movie theme. It evens revs the engine during the fake flush. He loves it! His blood pressure has been high tonight and his belly is distended again. So, we appreciate your continued prayers. This is a marathon, not a sprint. So good to have my boy home! 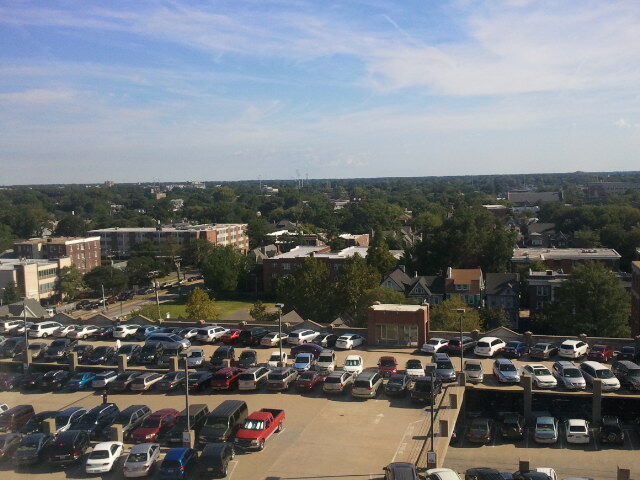 Going home in just a few hours!! I will never forget this day. Wow, wow, WOW! This has been an incredible day. It started in despair and it's ending in celebration. Sawyer bounced back from the intensive care unit, escaped another surgery, and now he has ended this day with the best dialysis treatment he has ever had. As of 6PM tonight, Sawyer more than surpassed his goal for his current dialysis treatment and he was only 1/3 of the way through it. This means no surgery tomorrow and we may go home! I will certainly never forget this day. We were crying out to God, along with hundreds of others, begging for mercy on Sawyer. He heard our cries and spared our boy. He moved in a big way. This has been evident to all of those around us. Many of the medical staff have commented about what happened today. One nurse said she was "inspired" by what she witnessed. So was I.
Karen and I have been humbled and we are truly grateful. We know there is so much suffering that takes place in this hospital. So many children have greater struggles. Sawyer is no better than these others and we are no more deserving as parents. We don’t know the mind of God and we certainly do not know where He is taking us on this journey, but we are grateful for the win today. We can’t thank you all enough for the prayers and support. It blew us away that people gathered together tonight to pray for our boy. I'll end tonight with a verse that has been sent to us several times over and has helped us in the storm. for the LORD GOD is an everlasting rock. The doctor just canceled surgery for today! Sawyer's potassium level came down again and the PD is working like a champ. We praise God for His mercy on Sawyer. We are so grateful. BTW, Sawyer just had a popsicle and is in much better spirits. I heard that some folks are coming together to pray for Sawyer tonight at Tabernacle Church of Norfolk. We are humbled and grateful for this outpouring of prayer and support. Thank you!! Yesterday it was determined that gas and fluid from ileus was causing complications with Sawyer's peritoneal dialysis (PD). His belly was so distended that the pressure was impeding the flow of dialysis. The doctor decided to stop the PD, let him rest, and send him to into surgery today to place a permanent catheter in Sawyer's chest. After this, they will transition him back to hemodialysis. Sawyer has had complications with hemodialysis (blood pushing to the spine). He has blown through two femoral catheters in both sides of his groin. IV's have been placed so many times in his arms and legs that the vascular specialists are challenged to find new places to stick him. IV ports only last about a day with Sawyer before they blow as well. The thought of another surgical procedure seems outrageous. Karen and I have been praying since last night for Sawyer to be spared from today's surgery. Since gas has caused issues with his PD, I encouraged the doctor to treat the gas last night. She was reluctant because she did not think it would make a big difference and therefore we would still need the surgery. Although, I asked the doctor to treat the gas, I determined in advance to not voice any concerns about the impending surgery. My hope and prayer was that Sawyer's belly would be so relieved by this morning that the doctor would second guess sending him to surgery and give his PD another try. So, not only have we been praying for #1 and #2, last night we added "passing gas" to the prayer list. Approximately, 30 minutes after we prayed last night, Sawyer's bowels started to move and he passed a lot of gas without intervention from any medication. Later into the evening he started receiving medications to move things along as well. By this morning, his belly looked almost completely relieved. Three different doctors examined Sawyer this morning and all three second guessed the surgery today. They thought he had improved so much that they felt confident to try the PD again. Yes! As we started the PD, a test came back indicating a dangerous level of potassium build up. 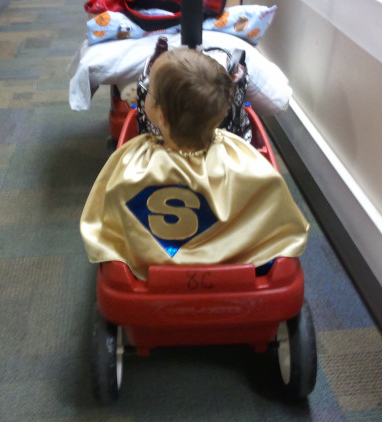 Sawyer was immediately rushed to the intensive care unit (PICU) to treat him. It was a flurry of craziness on our way to the PICU and in our first hour there. At least 10 medical staff were working on him at the same time. In the middle of all of this hoopla, Sawyer's PD was started and it began working beautifully. When we started the transition to the PICU, the doctor requested the PD be disconnected. The renal nurse knew we were getting a good result so she petitioned the doctor to change her mind about disconnecting. At this point, we have been through several hours of PD and it has been very successful. We are still in the PICU, the surgery is still scheduled for 4PM, but the doctor is becoming reluctant to move forward with surgery. I think the decision will be made by 3PM. This has been a hellish day. I have not even begun to describe the drama that has played out today. Karen and I hit a wall early on. However, in the middle of this hellish, painful and chaotic day, it has been made clear to Karen and me that God is with us. Not one bit of this escapes Him. We do not know how this is going to end, but we are keeping our eyes on Him in this storm no matter how loud the thunder gets or where the lightning strikes. I am well aware that many, many people are praying right now. We are so grateful and encouraged by the love being poured into our family. Potassium levels just reduced. Sawyer has been given something to relax him. Sawyer has many issues this morning. No time to explain. Back in the intensive care unit. Sawyer's potassium levels are dangerousy high. Sawyer is distraught. After ultrasound and more x-rays, it appears that Sawyer's intestines are too large because of gas and fluid. Sawyer's doctor says it is "ileus". Sawyer's bowels are moving too slow and there may be an infection. 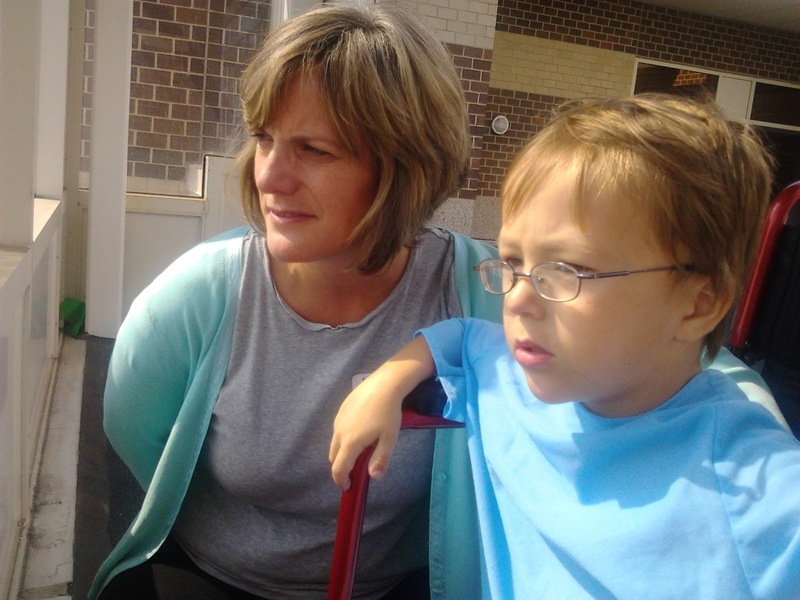 This complication is hindering Sawyer's peritoneal dialysis (PD). Now they are discussing another surgical procedure to put a port in his chest for hemodialysis. This would be horrible for Sawyer right now. Karen and I are hoping and praying this does not happen. Sawyer's belly is very distended. He is uncomfortable, but not crying out. Sawyer's doctor repeated that nothing goes as planned with Sawyer. Whatever has Sawyer is not turning him loose. We pray fervently and humbly for Sawyer to be released. Sawyer is so impacted now that he is unable to keep food down. Sparing you the gory details, Sawyer got really sick yesterday evening. He did not get upset, but it really surprised him. While we were cleaning him up, he said with his Sawyer-like accent, "Da' wuz fweaky." It's improbable that Sawyer will go home today. Not only does he need to get things flowing, his dialysis is still needing some adjustments. Last night I came home to start getting the house ready for all of Sawyer's medical equipment. So Karen was at the hospital by herself. By phone, the renal nurse walked Karen through re-programing his dialysis machine because of the issues Sawyer is experiencing. Karen got it done like a champ! Typically, I'm the one who learns and operates all of the technical stuff. However, Karen has really led out with Sawyer's treatments. I am so proud of her! This mamma bear will do whatever it takes to care for her cubs. Keeping you informed so you will know how to pray. Thank you for caring about our son! We were preparing to head home tomorrow, but Sawyer is still impacted. So, we wait it out. Also, he is getting uncomfortable again with his dialysis. The renal nurse is troubleshooting that issue. On the bright side, we get to wait until tomorrow to learn how to do injections. I'll gladly put this off for as long as possible. Special thanks to our church, Community Church of Chesapeake, for checking on our house post-Irene. Best view of the storm from our room. 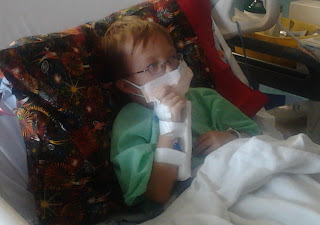 My little tough guy keeps getting tougher as he faces new challenges. Today's challenge… being impacted. I won’t go into the gory details but all attempts to relieve him today have been unsuccessful. He is not complaining, but the x-ray taken today shows that there is an issue. I have never in my life prayed so much about #1 and #2. Tomorrow's challenge will involve more training for Karen and me. We have to learn how to give Sawyer his regimen of injections. He will have a daily injection for growth hormones and a weekly injection to help with the production of red blood cells. I hate needles. It's a phobia for me. However, we press on. We have heard from a bunch of folks today. Thank you for keeping us in your thoughts and prayers during the storm. God has poured a lot of love into our family though you. So grateful! Today was a good day. Sawyer is experiencing very little discomfort with his dialysis. His current session will last 18 hours. We could not get the extension tubing needed to give him a longer leash. So, he will have to ride it out in bed. He did get a break for a couple of hours today and we took a short walk around our pod. We are getting a baptism by fire in peritoneal dialysis (PD) this weekend as we are essentially on our own. None of the PD nurses will be in Saturday because of the hurricane. We were told we know how to do PD better than anyone in the hospital over the next 48 hours. Scary, but the experts are a phone call away. Now that we have progressed in our training and Sawyer is stabilizing more and more everyday, we should be in the home stretch. 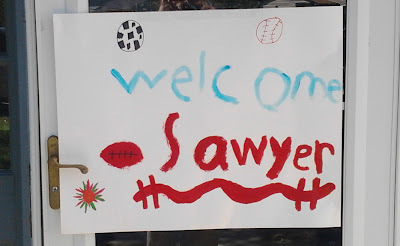 I anticipate Sawyer coming home on Monday or Tuesday. It will be intimidating to do dialysis at home, but it should become second nature soon. More of the "new normal". Sawyer is resting peacefully tonight (YES!). The renal nurse was still adjusting his peritoneal dialysis (PD) late into the evening until she found the best setting to allow Sawyer the least amount of discomfort. We are grateful and hoping he will sleep through the night. The training to perform PD at home is challenging. I'm grateful that my mom, Joyce Sanders, joined us. There is much to learn. Karen and I teamed up to start Sawyer's dialysis tonight, under the nurse's supervision, and it went well. I told Sawyer to call me "Dr. Daddy". He was not so amused especially since he does not currently hold doctors in high regard. This will change when he realizes one day that God used them to save his life. 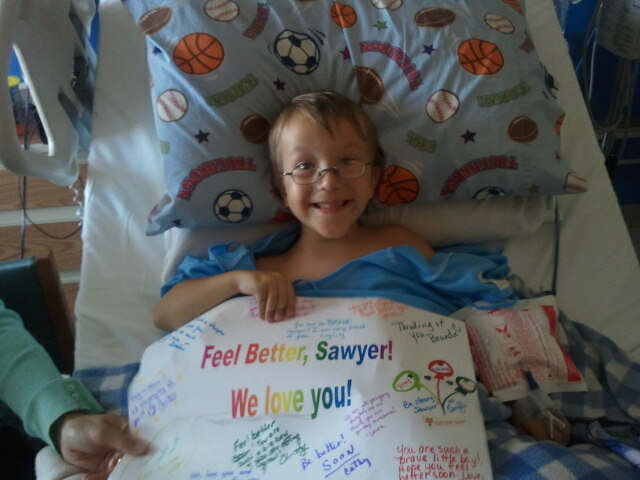 Here's the best news of the day, Sawyer walked! His leg strength improved greatly over yesterday. He shot enough hoops in the playroom to ruin the IV port in his wrist, which meant more poking and prodding by the nurses later. Special thanks to Lori Rosie for sitting with Sawyer all day today while we trained. She really lifted his spirits and poured a lot of love into my boy. So grateful for Lori. Sawyer's blood pressure became very unstable last night. It went high and stayed high for most of the night. Four different medications were given to bring it down. It's better, but they are still working through it. Also, Sawyer continues to feel pain during peritoneal dialysis (PD) and is traumatized by it. He has an episode of pain every hour when the fluid from the PD cycles. He received very little rest last night. We are hoping that an adjustment can be made today to ease his pain. In the middle of the night, I heard a faint cry from him. I went to his bedside and he said, "Dad, I'm scared." As you pray for Sawyer's healing today, please pray that fear would be removed from his heart and mind. As we hoped, Sawyer was freed momentarily from his bed today. 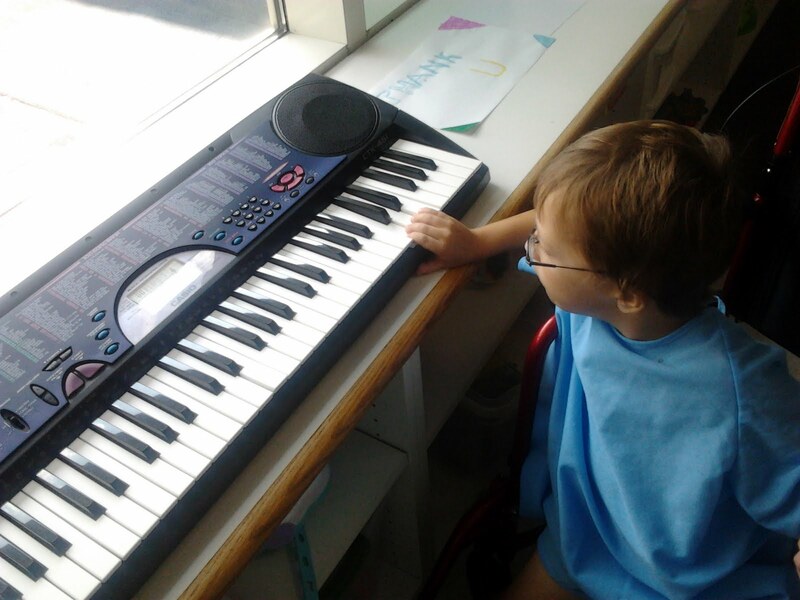 He has been in bed so long that he cannot walk, but that did not stop him from wanting to go to the playroom. He had a blast! As I stated in the last post, the doctor was forced to start using Sawyer’s peritoneal catheter for dialysis because his femoral catheter failed again. The good news is it worked. Unfortunately, Sawyer is traumatized by peritoneal dialysis (PD). PD works by filling his belly with a solution, letting it sit for an hour, draining it, and then repeating the process. Sawyer winces and cries out about the pain. It probably does not hurt much (according to the specialist), but the sensation is extremely unusual. This first dialysis will take 24 hours to complete. This means Sawyer is essentially stuck in bed again. We will attempt to stand him up and try different exercises to build up his leg strength, but no playroom. When we are doing dialysis at home it will be a daily 10 to 12 hour process that he will sleep through for the most part. By an objective assessment, we took a step forward today. However, it was a difficult step especially as the reality of our "new normal" is starting to sink in. A big reality check happened during our first session on kidney transplantation. We are leaning way into Him and grateful for His strength. “But, we are dealing with Sawyer ..."
During Sawyer’s dialysis today, the blood pushed towards his spine again causing a lot of pain. Either the catheter is damaged again or there is something about his circulatory system that is allowing this to happen. We could not finish dialysis. So, they are going to try and use the new peritoneal catheter that was surgically placed in his belly on Monday. They wanted to wait until Friday to use it. However, today will be the day. The good news is Sawyer’s femoral catheter will be removed today. This is a huge blessing. He will get to walk again and checkout the play room. As I shared in a recent post . Sawyer has been easily agitated, fearful, shut down and overall depressed as he tries to sort this all out in his 4 year old mind. However, today we had no procedures, dialysis or emergencies (other than the earthquake, but that doe not count!). So, we poured ourselves into getting his mind off of his condition. We had to be creative because he cannot move around much or leave his bed. He has a femoral catheter for dialysis that cannot be distrubed. He has not walked in a week and he may not walk again until friday. After lots of games, videos, smashing cars and action figures, opening cards from friends and partaking of his drink of choice, chocolate milk (renal friendly now), Sawyer started showing signs of life. He laughed, made us laugh, asked questions, told jokes, and schemed for many more cups of chocolate milk. We partied all day. One week ago today our world was turned upside down when Sawyer began experiencing kidney failure. 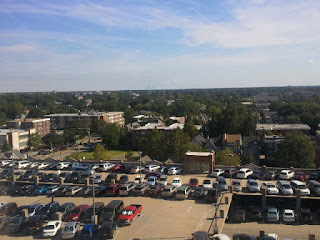 We thought it was going to be literally turned upside down here on the 8th floor of the Children's Hospital as it started swaying and shaking during the earthquake today. I started unplugging Sawyer from his machines. I didn't know how to get the catheter out of his bladder. So, I just handed the "pee bag" to Karen and said "let's go". Karen thought the nurses would stop me, but they said they wanted to go too. Karen and I laughed so hard when it was over. We thought, "Par for this course. Why not throw an earthquake into the mix?!?". Grateful for the laughter! Sawyer's pain has subsided this morning. He had three holes poked completely through his abdomen yesterday. One of which will be permanent until transplant. Yet, he has had no pain medication this morning. This little guy is a rock! Sawyer is still not talking much. He gets agitated easily. He keeps the volume on the TV inaudibly low and shuns all noise. I don’t blame him. He’s been through it. I know he is trying to process all of this and it is creating anxiety. Fear of the unknown is the worse for anyone, but especially for a four year old who cannot understand all of the components (more unknown). I pray Jesus will quiet Sawyer’s heart with His love. I feel like we turned a corner here yesterday. It got really bad one last time (not going there right now) and then a little light broke through the dark cloud that has been hovering over us for a week. We are so grateful. There are amazing people out there giving us a lot of encouragement. Although we cannot accept visitors right now, we know you are there. Love you and thank you! Very tired. This will be short. The pain meds are finally kicking in for Sawyer. He was pitful earlier, especially between doses. He is awake and alert, but he does not talk. It was another intense day, but God expressed Himself in many ways. He literally sustains us in ways that we would not imagine. He certainly works through His people... in a big way. Karen and I are extremely grateful. We are hoping for a good day tomorrow. No scheduled dialysis or procedures. Maybe our boy can finally rest. Minutes ago Sawyer came of of surgery. Praise our Lord, the procedure was a success. Of course, there were issues. The surgery time went way over. They found a hernia that will need to be addressed down the road. Also, his bladder was too full. Not sure if that is going to be an issue going forward. I have no time to type any thing else. Thank you for your prayers. Sawyer in a lot of pain. Tough little man! Starting dialysis very soon. It sounds sudden, but the doctor hopes to get him through dialysis while he is "knocked out". This is a battle royale for my little man. 08/22/11 11:03 A.M. We are waiting for Sawyer to come out of surgery. Here is one of my favortie videos of him. He thought he could fly. Sawyer finally finished his dialysis. They literally had to pause dialysis (because his catheter failed), leave his blood circulating in the machine, rush him to the PICU for the new arterial catheter and rush him back down to dialysis before his blood expired. These CHKD people are incredible! It's been a tough day. It broke our hearts to learn there are more issues lurking around the corner (see my last post). Tomorrow is shaping up to be another intense day. We head to the OR around 8:45 A.M. for the surgery to place the peritoneal catheter in Sawyer's belly. Also, Karen and I begin our many hours of training to learn how to care for Sawyer and perform dialysis at home. This day really stunk. Karen and I woke up anticipating a miracle for Sawyer. Instead, we go to bed greatly disappointed and heartbroken for our boy. Our disappointment is not in God. Is it His fault that Sawyer is struggling? No. We live in a world that has fallen and, as a result, death, sickness, pain and suffering are all around us. Sawyer is a casualty of this fallen and broken world. So, no... we are by no means disappointed by God. How could we be? He is our only hope. So. we praise Him in this storm. Sawyer is resting somewhat well at this moment. Thank you for continued prayer. If this mountain continues to grow bigger, it will make a greater splash when it is tossed into the sea. Sawyer Update: The Mountain Got Bigger. Test results show that Sawyer's kidneys have not improved. As they tried to get his dialysis going today, Sawyer's artierial catheter failed and caused blood to hit in his spinal area. We are having to have another catheter put in right away as he had already started dyalysis. They are rushing him to intensive care to have the procedure done. While they were trouble shooting the catheter, the x rays revealed an additional abnormality in his hips. Something much more is happening here. The mountain didn't move today, it got bigger. Sawyer has been through a lot, especially in the last 24 hours. He is getting ready to go through much more today. It is almost impossible to watch. Thank you for praying for God's healing. Pray that He will carry Sawyer today and calm Sawyer with His love. In this deep, dark and treacherous valley, we are on a mountain top full of LIGHT and LIFE. 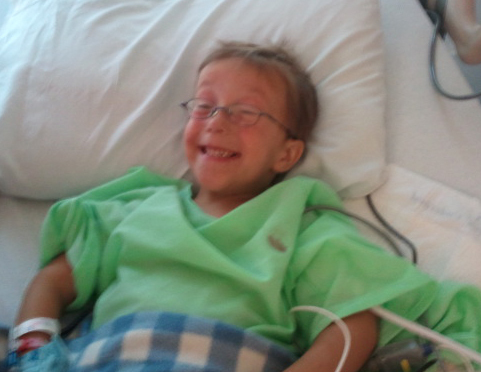 As many know,we were scheduled for surgery on Friday to place the peretonial catheter in Sawyer's belly. This catheter allows him to do dialysis at home in preperation for a kidney transplant. The doctor says dead kidneys do not regain function. Although, Sawyer's kidneys are not completely dead, there has been no hope given that they will ever work well enough to sustain him. Thus, the transplant. We felt like we got hit by a BIG MOVING BUS on Thursday when we received this information. Friday morning we were unsettled about the fast track to surgery. In short, we felt that we gave ourselves no opportunity to see God move. In passages of Matthew 21 and Mark 11, Jesus says "whoever says to this mountain,'Be taken up and thrown into the sea,' and does not doubt in his heart, but believes that what he says will come to pass, it will be done for him." Sawyer's kidney failure is our mountain. On Friday morning, we told our mountain to move! If Jesus, our Lord, was raised from the dead and one day He will raise us all from death, then these dead kidneys can be resurrected. We have this faith. Sawyer is no more deserving of healing than any of these other children here. Our hearts break to see them and hear the stories. However, Sawyer's kidney failure is our mountain and we are speaking to it. We are not commanding God, by no means are we giving Him advice, we are commanding our mountain. To God, we have humbled ourselves, turned away from our sin, sought His face and asked him to heal our son. We will place our trust in Him no matter the outcome. Our doctor is wonderful. Not only did she post pone the surgery Friday, she has paused Sawyer's dyalysis today so that we can good a good measurement of Sawyer's kidney function before surgery on Monday. We will know if his kidneys have improved sometime tomorrow (sunday). This is a CRITICAL 24 hours. We told our mountain to move on Friday. We will not know if it did until tomorrow. Those who are willing, will you join me and Karen in asking God today to bring Sawyer's kidneys back to life? Yes, this is a medical impossiblity. Even this morning our doctor told us that she did not expect any improvement. Yet, we still have this hope. 14if my people who are called by my name(A) humble themselves, and pray and seek my face and turn from their wicked ways, then I will hear from heaven and will forgive their sin and heal their land. Many of our friends do not have access to Facebook. Therefore, in this blog entry I'm copying all of my Facebook posts from the last few days. 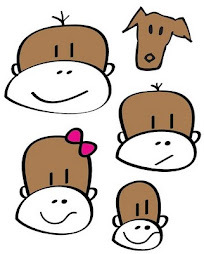 From this day forward, all of our updates should be available at www.debause.com or facebook. Thank you for your continued prayers! Taking Sawyer to ER. He has labored breathing, lots of swelling, fever, rash, etc. He had an adenoidectomy fri. Karen and I would appeciate your prayers. It looks like sawyer is going to be admitted. He was/is having an allergic reaction. However, multiple tests are showing kidney abnormalities. Your continued prayers are much appreciated. Sawyer's blood pressure and heart rate are too high. My battery has almost expired. This will be my last update until I get a charger. Sawyer's condition has not changed. Not sure what to expect here. We covet your prayers and are grateful that God hears us. Its comforting to know that none of this escapes Him. Sawyers kidneys have shut down. Kidneys may be operating at 10%. This is very intense. But God is revealing Himself to us. Very encouraging and comforting. Dear Friends, thank you so much for your prayers. Right now Sawyer is on dialysis because his kidneys are not working. there are many questions and few answers. However, the doctor performed a biopsy on his kidneys and we are expecting the result after lunch time tomorrow. This should bring answers. Karen are so grateful for all of you that have been praying and trying to contact us. Many have asked how they can help. My parents are taking care of our other children. Where we need you is in prayer support. Also, we are asking our friends to send us Bible verses. We are reading these verses over Sawyer in prayer. God's Word is powerful. Also, karen and I have been very encouraged as we read these verses. And there have been many! I will continue to read them over him throughout the night. A friend prayed this today: "Lord, we are so grateful for what you have done, desperate for what you can do". We are feeling desperate tonight. Lord, please heal our boy. we are speaking your prayers and verses over sawyer right now. We have no tests back, but the nurse believes there isincreased kidney production after observing his urine and reduced swelling. Lord, hear the crys of your people. Our boy is no better than any other child suffering in this intensive care unit. However, we boldly ask for your healing touch this morning. Please restore my boys kidneys. Sawyer is resting well right now. He is not labored in his breathing (another victory!) So many have been praying with us all night. Thk You!! 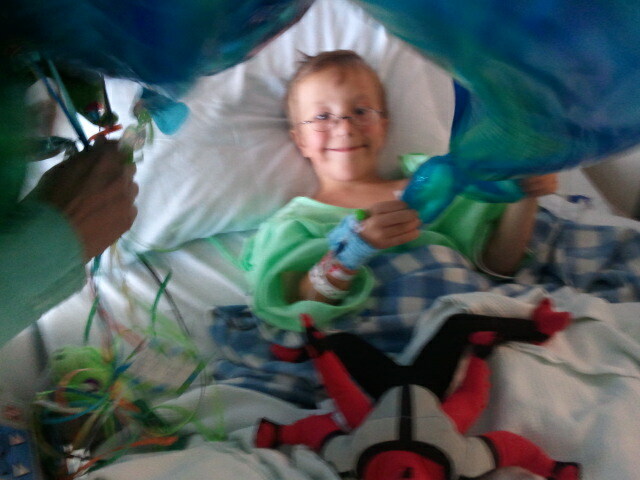 Balloon popper: doc says no improvement with kidneys. Biopsy results coming within the next few hours. 2nd round of dialysis starting now. Cardiologist checking on him as well today. This is going to be a very significant day for Sawyer and the rest of our family. We cherish your prayers and verses that you are sending. We spoke those verses over Sawyer all night long. No results from the biopsy yet. We expect to hear this evening. Dear Friends, Sawyer's kidneys are very unhealthy. The doctor does not give us hope that they will recover. Sawyer will have a surgery tomorrow to have a peritoneal catheter placed in his belly for continued dialysis. We will also start the process to get a kidney transplant. Thank you for your continued prayers. I will say more later, but this is the big stuff. Dear friends, we need rest today and to rest in His word. Love you all. Dear Friends, Yesterday Sawyer let us all know that he was "done". He is tired of this place and all of the poking and prodding. The steroid treatment is making him even more aggressive in his anger and irritation. We have been even more sensitive to him, pushing more conversations with medical staff to the hall way, as Sawyer is no dummy. He processes these conversations and it bring him more anxiety. Pray God's love will calm him. The next 24 hours are critical. We slowed this process down anticipating a miracle. However, if his kidneys do not come alive, we will have to proceed with the surgery for the peritoneal catheter on Monday. We stand in confidence that our Lord is mighty to save and we continue to rest in His word. This is an intense physical and spiritual battle. Your prayers, verses, and kindness mean more thank you know. Thank you. Praise God! My boy justg pee'd!!! !